By establishing and maintaining strong international partnerships, U.S. higher education institutions can offer their students affordable study abroad options that easily fit in to their degree requirements. Study abroad partnerships can also open the door for a wider international exchange of research, ideas, and best practices between institutions. International partnerships help U.S. colleges and universities build global campuses and prepare students to work across various countries, cultures, and languages. This is why USA Study Abroad is dedicated to helping U.S. higher education institutions build partnerships with their foreign colleagues. 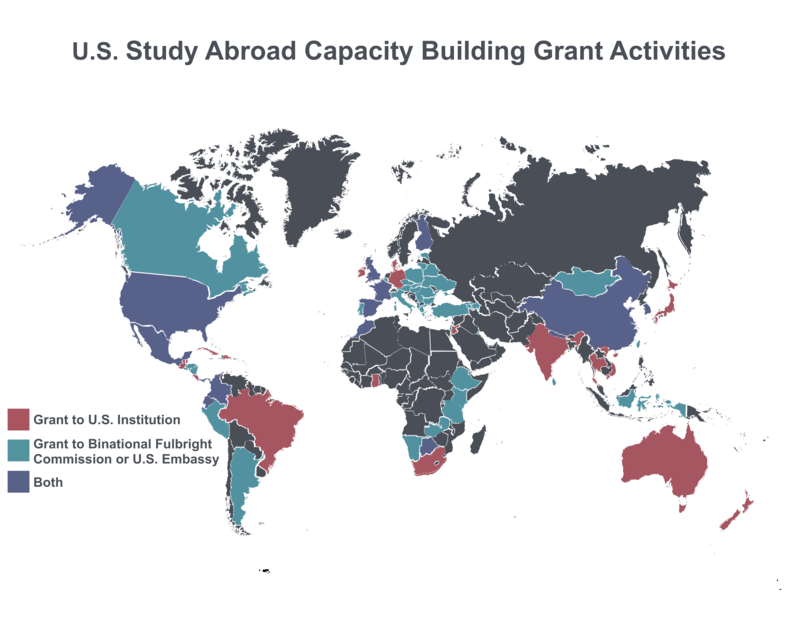 Since 2008, we have awarded study abroad capacity building grants to 64 U.S. colleges and universities in 35 states to increase and diversify U.S. study abroad in 42 countries around the world. These grants have allowed U.S. higher education institutions to build new partnerships and expand current ones to offer study abroad programming to more diverse students in more diverse destinations. Highline Community College and its partner Tacoma Community College (TCC) serve a diverse community of students in Washington that include a significant concentration of immigrants, refugees, and young families with limited financial resources. Both schools struggled to enroll students in study abroad programs due both to students’ financial barriers and decreased institutional funding for study abroad initiatives. To address these two challenges, Highline and TCC used a Domestic Capacity Building grant to strengthen an existing partnership with Shanghai Jiao Tong University (SJTU) and pilot an affordable study abroad program catered to the academic and financial needs of the two community colleges’ unique populations. Within the first year, the universities sent four faculty to SJTU to discuss the partnership and logistics, developed training materials for faculty leading short-term study abroad programs, developed resources for students seeing financial aid for study abroad, and raised funds to provide study abroad scholarships. USA Study Abroad is also grateful for its own partners within the higher education community. Thank you to the many study abroad offices, academic advisers, and professors who support students as they apply for our Benjamin A. Gilman International Scholarship Program and Critical Language Scholarship Program. Many of these same people also volunteer their time on selection panels for these nationally competed awards. You help us find the amazing students we send on our programs. Learn more about our Study Abroad Capacity Building Initiatives here.